HMS Hercules, a 20000-tonne aircraft carrier, was still under construction in the United Kingdom when Germany and Japan surrendered after World War II. Admiral White Hall laid off the ship in Garelockhead Scottish lakes near Glasgow at anchorage in a preserved state. To maintain all metal and wooden parts under vacuum conditions, powerful machines were employed in the cocooned ship. One fine morning in 1957, the Government of India decided to purchase this ship. It is now 46 years since this grand ship was acquired from the British by India. 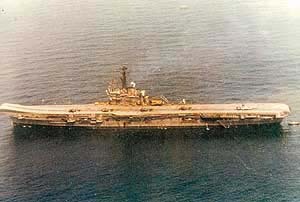 It was renamed ‘Vikrant’ and commissioned on January 16, 1961. It served gloriously for more than 30 years as a flagship of India. On January 31, 1997, it was decided to decommission it and convert it into a floating naval museum. On arrival at Mumbai for the first time, it was received by Prime Minister Jawaharlal Nehru on November 3, 1961. From that day onwards up to her decommissioning, it visited Trincomalee, Singapore, Kuwait, Bahrain, Lakshadweep, Iran and several other countries, showing our flag as a gesture of goodwill. During this period, thousands of VIPs and foreign dignitaries visited the ship. On these visits, the overseas Indians were elated to see and touch the great ship which symbolised the strength and maritime glory of their motherland. The most important role of the Vikrant commenced on December 3, 1971, when hostilities against Pakistan commenced. Vikrant gave a star performance in these operations. Her Alizes and Seahawk aircrafts pounded ships and harbour structures relentlessly at Cox’s Bazar, Hat Hazar, Dohazari and Chittagong, causing extensive devastation and rendering all harbour facilities useless. This superb feat hastened the final surrender of the Pakistani forces. The hundreds of sorties launched by the steam catapult from the angled flight deck had a devastating effect on the enemy’s morale. On decommissioning, all sensitive equipment has been removed from the vessel, anchored near oyster rock in Mumbai. The public can have a close look at the flight deck, deck-landing mirror site which costed more than a crore each, the aircraft lift which can raise 400 persons at a time and the aircraft arresting wires, etc. Besides, this aircraft carrier’s name has been associated with a historical happening to which much publicity has not been given so far. This episode relates to the failed but well-planned attack of Pakistani submarine PNS Gazi just before the commencement of the 1971 war. The news of the deployment of India’s flagship Vikrant in the Bay of Bengal made Karachi plan a devastating pre-emptive move against INS Vikrant. The enemy planned that PNS Gazi would rush to the Bay of Bengal and target the Indian aircraft carrier. The deployment of the submarine PNS Gazi was kept secret as a measure of utmost strategic caution. Vikrant took its position in the Andaman and Nicobar Islands. Thus, she was away from the direct gaze of the enemy intelligence as well as the international media. 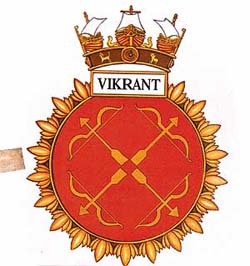 The strategists at Karachi guessed that Vikrant, deployed in the Bay of Bengal, was likely to visit the prime naval base at Vishakhapatnam for logistics and other support or to seek harbour protection there. PNS Gazi, therefore, chose to wait under the surface in a fully dived condition outside Vishakhapatnam harbour. Subsequent analysis of the sequence of events by defence specialists later confirmed this. Those days, I was on duty with the Eastern Naval Command. On declaration of war at 7.30 pm, December 3, 1971, the destroyer INS Rajput was ordered to leave for the Chittagong area, with full despatch. As she raced northwards, she fired depth charges on both sides. This was done as a matter of utmost caution in the theatre of war waters likely to have enemy submarine presence. At that time, the captain of the destroyer did not realise that the routine firing of depth charges had grievously damaged the Pakistani submarine beneath. It was a prize trophy, the eventual finding of which was to be a historical and glorious achievement for the Indian Navy. Within 40 hours, a fisherman operating close to the Bimlipattam coast reported finding a lifebouy with PNS Gazi painted on it and some other floating debris. These were personally taken to the Commander-in-Chief, Eastern Naval Command, Vice-Admiral N. Krishnan, who rewarded the fisherman suitably. In order to verify this, a team of divers was sent to the spot. Divers confirmed that the Pakistani submarine was in fact lying badly damaged on the seabed and there was no sign of life on board. It was essential to recover the ship’s log book from the sunken and dead submarine tilting on one side to ascertain the motive of the enemy ship and the route followed by her in reaching there. After weeks of preparation and at a hefty cost, divers retrieved the ship’s logbook as well the famous tapes containing the Pakistani Prime Minister’s speeches. These, along with some other artifices, are now displayed in the Naval Museum at Vishakhapatnam. The divers, while going around the ship’s silhouette lying on the seabed and covered with mild coral growth, had noticed that some of the ship’s crew had attempted to wrongly come out of the submarine through the conning tower hatch. The Indian Government also decided that no bodies of dead naval personnel on board were to be removed ashore. The precise point where the submarine is lying has been marked on sea navigational charts by a marker bouy. Many visitors like to have a look at the sunken hull but every trip is a costly affair. The rescue vessel INS Nireekshak, commissioned recently, makes the underwater trips more organised but the cost is still beyond the reach of the common man. While the Gazi lies silent in a dark and dingy seabed, the Vikrant is majestically awaiting a new role in Mumbai .